The Last week of Cooking Carnival 2016, i chose the theme : Spreads. 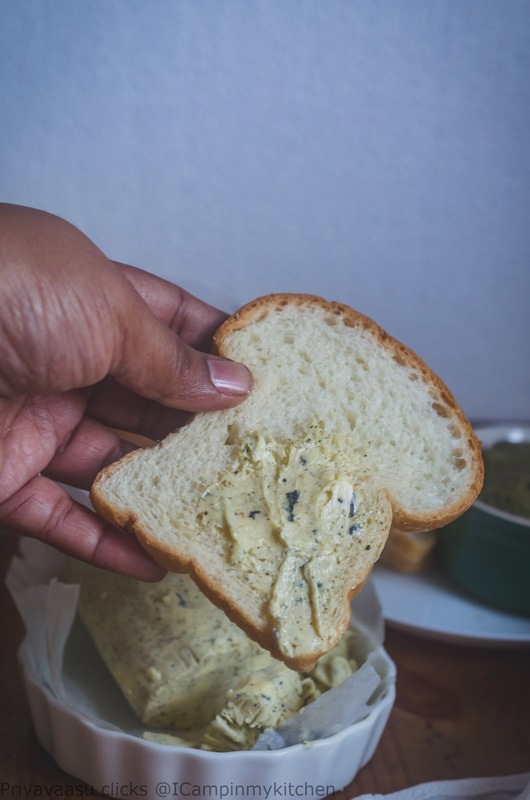 According to Wiki, a spread is a food that is literally spread, generally with a knife, onto food products such as bread and crackers. 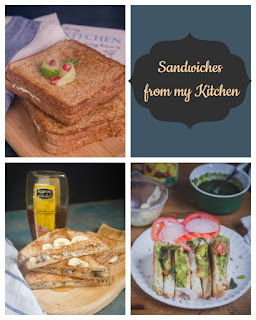 Spreads are added to food in order to enhance the flavor or texture of the food, which may be considered bland without it. When thinking about spreads, the first thing struck me was butter. I lovee butter on my toasts and on parathas's, who doesn't right? 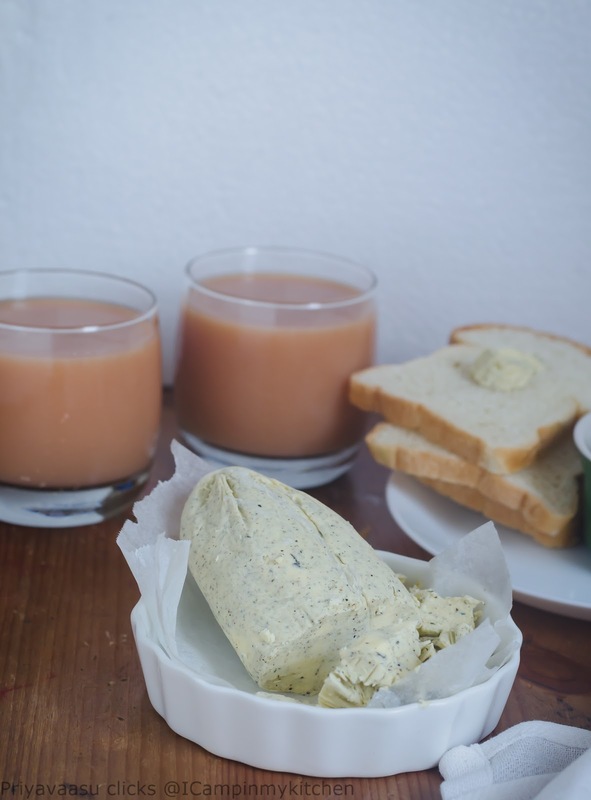 So, the first recipe i made was this Garlic butter, it is way easy to make than i imagined. Just blitz and freeze, you have finger-licking butter for your next day breakfast. Take butter, garlic cloves, mint leaves, pepper and salt in a food processor bowl. Blend to combine.Remove the butter on to a cling wrap or parchement paper. Roll and refrigerate until set.Use as required as a spread on toast, parathas, soups. I served them on toast along with Mango, Pomo & Orange smoothie, Another yumm ridgegourd peel and mint leaves chutney and red bell pepper dip. That is a super flavourful butter. Now I want that slice.. I love to try new butters , I have tried this one and it is irresistible . Looking forward to more in this theme . That is definitely an aromatic and flavorful butter. garlic mint butter is super awesome. Bookmarking it. Omg, this butter is my fav, just feel like making some garlic bread toast rite now. Aromatic butter. 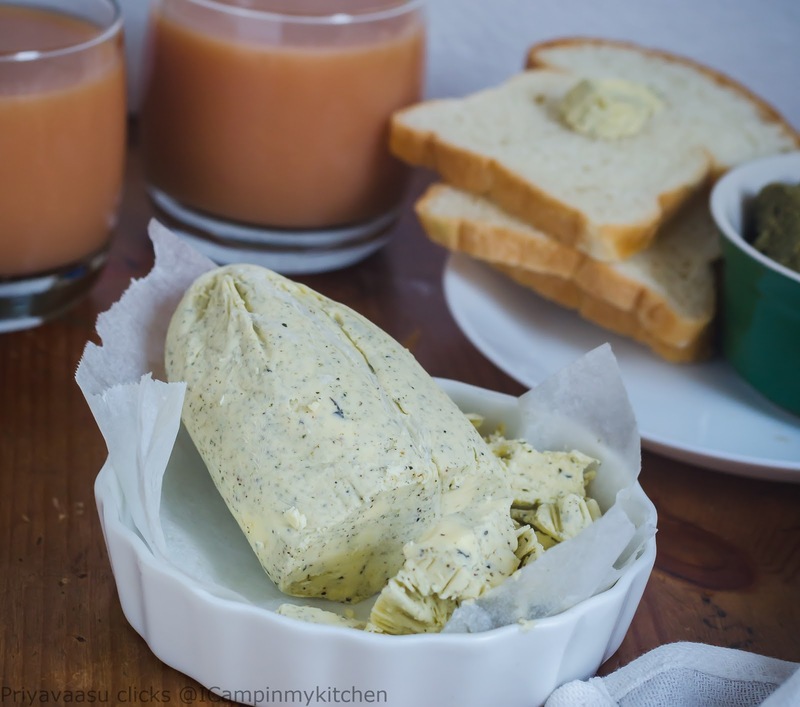 I haven't made flavored butters at home even though they are simple to prepare. Your's is one flavorful spread. That's such a flavorful and delicious flavored butter. Mint with garlic sounds like a great idea!! Perfect spread for breads! Garlic butter itself is so flavorful and adding mint sounds more exotic. Yumm butter. I had read about this but was not sure how to go about it. Thanks. I keep making this often, and simply love it!..very nice..